samaa.tv: TEHRAN, Iran: A movie about a young girl whose fantasy world helps her escape the hard realities of growing up in the countryside near Tehran in the aftermath of the 1979 Islamic Revolution is Iran’s first-ever submission for the Academy Awards’ foreign film directed by a woman, reported AP. The mixed reaction to Narges Abyar’s film “Nafas,” or “Breath,” shows how art cuts across Iranian politics, both at home and abroad. ard-liners have criticized the movie, and it remains unclear whether Abyar and her husband would even be able to get a visa to attend the Oscars in March under President Donald Trump’s travel bans. Nominations for the Oscars will be announced in January. Yet the 47-year-old director and writer Abyar remains confident in the power of art to bridge cultural and political divides. “Cinema, culture and art do not recognize any border, but in fact bring humanity closer together,” she told The Associated Press in a recent interview. “Breath” focuses on Bahar, a lively girl whose asthmatic father is bringing her and her siblings up on his own, with the help from the children’s religious grandmother. The film shows the rapid changes that hit Iran after the Islamic Revolution, and later, as Scud missiles fall, Iraq’s invasion of Iran and the start of the ruinous eight-year war. Parts of the film take place in Bahar’s imagination as she tries to escape the hardship around her. “Don’t let her read so much. She’ll go crazy,” the grandmother tells Bahar’s dad in a scene shown in the film’s trailer. Abyar acknowledges she made an anti-war film. “The only thing that could destroy her fantasies and imagination was war,” Abyar said of Bahar’s character. “This film shows us the obscene face of war that we should avoid, this is what politicians won’t tell you,” she added. Bahar refuses to attend Quranic classes, alleging her teacher was being mean to her. Her uncle later teaches the girl how to read the holy book — though she prefers another that she found despite a plot she cannot grasp, a story about girls being kidnapped and put in a house full of prostitutes. Not surprisingly, the film’s topics have proven controversial for Iran’s hard-liners who describe the Iran-Iraq war in religious terms as the “Holy Defense” of the Shiite power from dictator Saddam Hussein’s Sunni-dominated government. 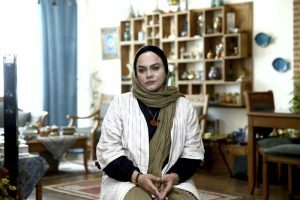 They have unleashed criticism on Abyar, despite the fact that her first film, “Shiar 143” or “Track 143,” earned her hard-liners’ praise for focusing on the role of mothers during the Iran-Iraq war. “This movie is showing exactly what our enemies in the West want to see,” said hard-line cleric Ahmad Alamolhoda, an ally of Supreme Leader Ayatollah Ali Khamenei. Gen. Mohammed Reza Naghdi, a senior commander of Iran’s powerful paramilitary Revolutionary Guard, offered a similar view. “The West is already spreading enough negative propaganda against us, so we shouldn’t spend our taxes on such a film,” Naghdi said, citing that the state-run Farabi Cinema Foundation submitted “Breath” for the Oscar. Art can be a dangerous profession in Iran and filmmakers have fallen into trouble before. Award-winning Iranian filmmaker Keywan Karimi was released in April, after serving about five months of his year-long sentence over his work, though he escaped the 223 lashes that were part of his sentence. He later told the AP that he doesn’t know whether he’ll make movies again in the Islamic Republic. International politics also comes into play in Iran’s cinema. While the Farabi Cinema Foundation routinely submits films to the Academy Awards, tensions rise and ebb between Iran and the U.S. in the years since the 1979 revolution and takeover of the U.S. Embassy in Tehran. While tensions appeared to ease slightly under President Barack Obama and with the 2015 nuclear deal, Trump has taken a much harder line than his predecessor. Iran has been on every iteration of Trump’s travel ban predominantly targeting Muslim-majority nations. Iran also has been removed from the U.S. green card lottery as well. Last year, Iranian director Asghar Farhadi won his second Oscar with his film “The Salesman,” but declined to attend the award ceremony because of Trump’s travel ban. But even he faces criticism from hard-liners and has been working on his next film outside of the country. For Abyar, she and her husband would attend the awards if they are granted visas, she said, though she didn’t hold back from criticizing Trump herself. Under Iran’s Islamic law, imposed after the 1979 revolution, women are obligated to cover their hair and wear long, loose-fitting clothes for the sake of modesty. Violators are publicly admonished, fined or arrested. Although no official records have been collected, a report by campaign group Justice for Iran in 2014 found over 10 years nearly half a million women were cautioned and more than 30,000 women arrested in cities across Iran over the hijab law. The #whitewednesdays campaign is part of a larger online movement started three years ago by Alinejad, a journalist who has lived in self-imposed exile since 2009.